NOTE: Clicking on the CD title link will take you to where you can purchase that CD. Shopping in our online book store is 100% safe. GUARANTEED. Search for CDs not listed in the book store by using the "Popular Music" link in the book store search engine at the bottom of the page. David's haunting music on acoustic guitar touches the listener's heart with the anticipation and ultimate fulfillment of the journey home. His delicate melodies, continually reinventing themselves, and the rich colors he gently coaxes from his instrument, reflect his experience both as a musician, and as an individual who has spent the major portion of his life seeking inner understanding. David's style is all his own, developed over many years as a performer and composer. His work involves various techniques, including finger style, flat-picking, jazz chording, spontaneous improvisation, classical, rock, blues, and folk. David pulls these various elements together in a unique mix that creates a timeless space in sound. 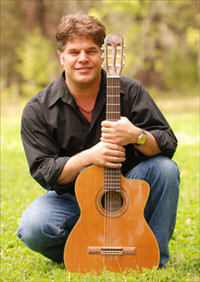 David Modica's music is available for purchase from David's Website. Acoustic Earth, Electric Sky - David Modica - (November 2008): Moving and stirring with hints of influences from Led Zeppelin to Pink Floyd, and also jazz guitarists Pat Metheny and John McGlaughlin. Stillness & Movement - David Modica - (July 2008): Pure acoustic guitar music taking the listener to a new world of emotions that fulfill the senses. Timeless - David Modica - (July 2008): Reflective acoustic guitar music taking the listener on a journey through a timeless space. Larry's Review: I met David at Guy Finley's Talk in the Pines in 2006. His music touched my soul. It is inspiring, soothing and if you like it as much as I do, you'll tell your friends. I do.